When it comes to upgrading your Drobo to a larger or newer version, you have several options. Use the links below to navigate to the scenario that best fits your current configuration. In most cases, migrating your "disk pack" (set of drives) from an older Drobo to a newer one is as simple as removing them from the older one, and placing them in the new one. Also note that in most cases migrating drives is a one-way operation. Once you move drives, you will no longer be able to access the data they contain with the older Drobo. NOTE: The following migration option is NOT supported: DroboPro to a Drobo other than DroboPro, that is, only DroboPro to DroboPro is supported. UPDATE: Disk packs from Drobo (Gen 2) and Drobo S can be migrated to the new Drobo 5D. Since Drobo Mini introduces a new form factor for drives, only migration from another Drobo Mini is supported. WARNING: DO NOT migrate drives when either Drobo is turned on. This can result in data loss. The firmware on the older unit should be updated to the latest version before the pack is moved to the new Drobo unit. IMPORTANT! Disk packs created or updated on Drobo Gen 2 running firmware version 1.4.0 to Drobo S firmware version 2.1.1 and earlier is not currently supported. Please check to ensure you have the latest Drobo Dashboard and firmware on both Drobo and Drobo S before moving disk packs. Migrating drives to a Drobo S is a one-way operation, that is, once you move drives from a Drobo to a Drobo S, you will no longer be able to use them in the Drobo. Put both your Drobo and Drobo S into standby using Drobo Dashboard or your operating system and then power off each array. Remove ALL disks from Drobo and insert ALL disks into Drobo S.
Power Drobo S back on. Connect Drobo S to your computer and ensure it has sufficient free capacity to accommodate the additional data from Drobo. 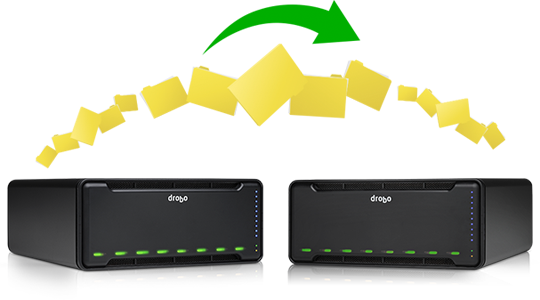 Copy ALL filesfrom Drobo to Drobo S.
If you would then like to add the drives from the Drobo to the Drobo S, remove the drives from Drobo and place them one at a time in the free data bays in Drobo S.
Note that this will ERASE ALL DATA on these drives. This step cannot be undone. If you aren't sure that you've successfully copied all data onto Drobo S, do not complete this step. NOTE: If your Drobo was formatted using Drobo firmware v1.03 or earlier, you will be unable to directly swap your drives from Drobo into Drobo S. This applies to most but not all 1st Generation (USB-only) Drobos. When you insert the disks into Drobo S a warning dialog will inform you of this, pointing you to this webpage. This process is necessary to upgrade you to the latest software that ensures maximum expandability in the future. 1 1st Generation (USB-only) Drobos formatted using Drobo firmware v1.10 or later may also follow these instructions. You can determine which upgrade path is necessary by inserting your whole Drobo disk pack in Drobo S. If you receive an error message, please follow the steps for a 1st Generation (USB-only) Drobo. To move your data from another model to Drobo FS, connect both computers simultaneously and copy the files you'd like to share. Connect Drobo FS to your network and ensure it has sufficient free capacity to accommodate the additional data from your Drobo. Copy ALL files from Drobo to Drobo FS. If you would then like to add the drives from the Drobo to the Drobo FS, remove the drives from Drobo and place them one at a time in the free data bays in Drobo FS. Note that this will ERASE ALL DATA on these drives. This step cannot be undone. If you aren't sure that you've successfullycopied all data onto Drobo FS, do not complete this step. IMPORTANT! Disk packs created or updated on Drobo Gen 2 running firmware version 1.4.0 to DroboPro firmware version 1.2.1 and earlier is not currently supported. Ensure you have the latest Drobo Dashboard and firmware on both Drobo and DroboPro before moving disk packs. Migrating drives to a DroboPro is a one-way operation. Note that once you move drives from a Drobo to a DroboPro that you will not be able to use them in the Drobo. Put both your Drobo and DroboPro into standby using Drobo Dashboard or your operating system and then power each array off. Remove ALL disks from Drobo and insert ALL disks into DroboPro. 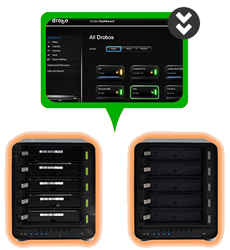 Install the version of Drobo Dashboard software that came with your new DroboPro (or later). Connect DroboPro to your computer and ensure it has sufficient free capacity to accommodate the additional data from Drobo. Copy ALL files from Drobo to DroboPro. If you would then like to add these diska to DroboPro, remove themfrom Drobo and place them one at a time in the free data bays in DroboPro. Note that this will ERASE ALL DATA on these drives. This step cannot be undone. If you are unsure if you have successfully copied all data onto DroboPro, do not complete this step. NOTE: If your Drobo was formatted using Drobo firmware v1.03 or earlier, you will be unable to directly swap your drives from Drobo into DroboPro. This applies to most but not all 1st Generation (USB-only) Drobos. When you insert the disks into DroboPro a warning dialog will inform you of this, pointing you to this webpage. This process is necessary to upgrade you to the latest software that ensures maximum expandability in the future. 1 1st Generation (USB-only) Drobos formatted using Drobo firmware v1.10 or later may also follow these instructions. You can determine which upgrade path is necessary by inserting your whole Drobo disk pack in DroboPro. If you receive an error message, please follow the steps for a 1st Generation (USB-only) Drobo. In general, you cannot migrate data by moving hard drives from the Drobo to the DroboElite. Instead, you will need to copy the data from the Drobo to the DroboElite. Install the version of Drobo Dashboard software that came with your new DroboElite (or later). Connect your Drobo to your computer via the USB/FireWire connection1. Connect your computer and your DroboElite to a network switch. Configure the iSCSI setup on your DroboElite so your computer is on the same subnet as the DroboElite. Verify your DroboElite has sufficient free capacity to accommodate the additional data from Drobo. Once connected, simply copy your files from Drobo to DroboElite. Verify ALL files are in place and fully accessibly on DroboElite. If you would then like to add the drives from the Drobo to the DroboElite, remove the drives from Drobo and place them one at a time in the free data bays in DroboElite. have successfully copied all data onto DroboElite, do not complete this step. 1 FireWire connection is available on 2nd generation Drobo only. In general, you cannot migrate data by moving hard drives from the DroboPro to the DroboElite. You will need to copy the data from the DroboPro to the DroboElite. Connect your DroboPro to your computer via the USB or FireWire connection. Once connected, simply copy your files from DroboPro to DroboElite. If you would then like to add the drives from the DroboPro to the DroboElite, remove the drives from DroboPro and place them one at a time in the free data bays in DroboElite. Note that this will ERASE ALL DATA on these drives. This step cannot be undone. If you are unsure if you have successfully copied all data onto DroboElite, do not complete this step. In general, you cannot migrate data by moving hard drives from the Drobo, Drobo S, or DroboPro to the DroboPro FS. The reason is that the file system layouts are slightly different on the DroboPro FS as compared to other Drobo storage systems. You will need to copy the data from the Drobo, Drobo S, or DroboPro to the DroboPro FS. Install the version of Drobo Dashboard software that came with your new DroboPro FS (or later). Connect your Drobo, Drobo S, or DroboPro to your computer via the USB or FireWire connection. Connect your computer and your DroboPro FS to a network switch. Configure the network setup on your DroboPro FS so your computer is on the same subnet as the DroboPro FS. Ensure your computer and DroboPro FS are connected and you have the Public share on the DroboPro FS mounted on your computer. Verify your DroboPro FS has sufficient free capacity to accommodate the additional data from Drobo, Drobo S, or DroboPro. Once connected, simply copy your files from Drobo, Drobo S, or DroboPro to the DroboPro FS. Verify ALL files are in place and fully accessibly on DroboPro FS. If you would then like to add the drives from the Drobo, Drobo S, or DroboPro to the DroboPro FS, remove the drives from old Drobo system and place them one at a time in the free drive bays in DroboPro FS. have successfully copied all data onto DroboPro FS, do not complete this step. Moving your data from Drobo FS to a Drobo B800fs is simple. The disk packs are directly transferrable between the Drobo FS and the Drobo B800fs. Ensure that the Drobo B800fs is updated to the latest version of firmware by "checking for updates" in Drobo Dashboard. Power off both the Drobo FS and the Drobo B800fs. Remove ALL disks from Drobo FS and insert ALL disks into Drobo B800fs. Power the Drobo B800fs back on. Read/Write performance fastest – Read and write performance increased due to new drive and format optimisations. Zero down time – Drobo FS shares are still available for use while copying data to the new Drobo 5N. Redundancy – Existing data remains on the Drobo FS. Cost – Additional drives to purchase for the Drobo 5N. File Transfer Time – Depending on network connection and amount of data transferred, this can take hours. Setup – Requires creating newusers, shares and mounting them on each host on the network. Insert new drives into the Drobo 5Nwith capacity greater than or equal to existing Drobo FS. Ensure that both the Drobo FS and Drobo 5N are updated to the latest version of firmware by "checking for updates" in Drobo Dashboard. Connect the Drobo 5N to network and power it on. Copy ALL files from the Drobo FS to the Drobo 5N over the network. Verify ALL files are in place and fully accessible on the Drobo 5N. Note: A disk packrefers to all drivesinstalled in a Drobo. Any drive inserted into an existing disk packwill be erased before being added to the disk pack. Note: Disk pack migration involves moving ALL drivesin the disk packfrom one Drobo to another. WARNING! Do not migrate drives when either Drobo device is powered on. Do not mix drives from different disk packs. This can result in data loss. Fastest transfer of data to the Drobo 5N – As fast as powering down the Drobo FS, migrating the disk pack to the Drobo 5N and powering it on. Read/Write performance – Read and Write performance about 75% compared to a Drobo 5N with a new disk pack. Down time – Requires powering off the Drobo FS in order to migrate the disk pack. Safely power down both the Drobo FS and Drobo 5N. Remove ALL drivesfrom Drobo FS and insert ALL drivesinto the Drobo 5N. Power Drobo 5N back on. Within a few minutes,shares, data and userswill be visible on Drobo Dashboard. Do not reset or unplug your Drobo during this process. The Drobo 5D supports migrating entire disk packs from a Drobo or Drobo S, preserving all the data and volumes you created. You can also migrate disk packs from one Drobo 5D to another. To ensure a safe and successful migration, carefully follow the steps below. A disk pack functions as a unit. 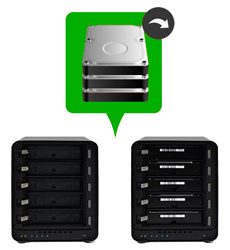 When you migrate a disk pack, you move ALL the drives from one Drobo device to another. Only after migration of the disk pack is complete can you add additional drives to the new Drobo device, one at a time, if desired. If you are migrating the disk pack from a Drobo or Drobo S to a Drobo 5D, note that this is a one-way migration. After the migration, you will not be able to use the disk pack in the Drobo or Drobo S.
For information on migrating data (as opposed to the disk pack) from one Drobo device to another, see Drobo Migration at the top of this page. Warning! Do not migrate drives when either Drobo device is powered on. This can result in data loss. Ensure you have set up your Drobo 5D (but without inserting drives) and connected it to your host computer. Ensure that your Drobo or Drobo S (with its drives) is still connected to the host computer. In Drobo Dashboard, on the All Drobos page, select the Drobo or Drobo S, and then click the Tools option on the Navigation menu. If needed, follow the same steps to ensure the Drobo 5D has the latest firmware. Safely shut down the Drobo or Drobo S and the Drobo 5D. Remove ALL drives from the Drobo or Drobo S and insert ALL drives into the Drobo 5D. Turn the Drobo 5D back on by pressing its power toggle button. The Drobo 5D may take a few minutes to boot up. When finished, all the data and volumes will be available on the Drobo 5D as it was on the Drobo or Drobo S.
Note: You can also follow these steps to migrate a disk pack from one Drobo 5D to another Drobo 5D. Read/Write performance improvement – Read and write performance increased due to new drive and format optimizations. Zero down time – Drobo FS / Drobo 5N shares are still available for use while copying data to the new Drobo 5N2. Redundancy – Existing data remains on the Drobo FS / Drobo 5N. Increased capacity - The maximum volume size on the Drobo FS is 16TB (ext3 filesystem), the same goes for the Drobo 5N disk packs (created before 3.5.0 firmware). The 5N2 has 64TB volume size (ext4 filesystem). Cost – Additional drives to purchase for the Drobo 5N2. 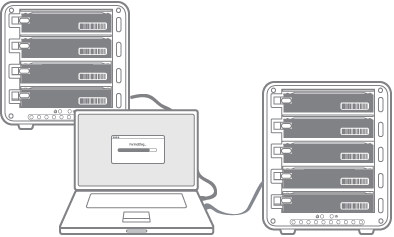 Setup – Requires creating new users, shares and mounting them on each host on the network. Insert new drives into the Drobo 5N2 with capacity greater than or equal to existing Drobo 5N or Drobo FS. Ensure that both the Drobo FS / Drobo 5N and Drobo 5N2 are updated to the latest version of firmware by "checking for updates" in Drobo Dashboard. Connect the Drobo 5N2 to network and power it on. Copy ALL files from the Drobo FS / Drobo 5N to the Drobo 5N2 over the network. Verify ALL files are in place and fully accessible on the Drobo 5N2. A disk pack refers to all drives installed in a Drobo. 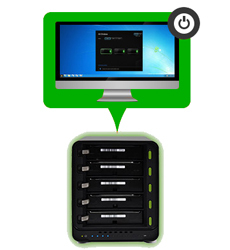 Disk pack migration involves moving ALL drives in the disk pack from one Drobo to another. We advise that the disk pack is in an all green state and data is accessible on their Drobo FS / Drobo 5N before migrating the pack to 5N2. Total Volume - If the maximum volume size on the Drobo FS / Drobo 5N is 16TB. The maximum available usable capacity will stay at 16TB, if the pack is migrated to the 5N2. Down time – Requires powering off the Drobo FS / Drobo 5N in order to migrate the disk pack. Safely power down both the Drobo FS / Drobo 5N and Drobo 5N2. Remove ALL drives from Drobo FS / Drobo 5N and insert ALL drives into the Drobo 5N2. The Drobo 5D3 supports migrating entire disk packs from another Drobo device to your Drobo 5D3, preserving all the data and volumes in the source Drobo Device. You can also migrate disk packs from one Drobo 5D3 to another. USB and Thunderbolt products cannot be migrated to NAS products or vice versa. Migration to Drobo 5D3 is not supported from Drobo Gen1 or Drobo Gen2 devices. When to use Copy Data? You can copy the data from one Drobo device to another, if data migration is not supported between your Drobo devices (see above for list of supported devices). Ensure that you have the latest Drobo Dashboard 3.1.2+ as well as the latest firmware on both source and destination (5D3 4.0.2+) Drobo devices before moving the disk packs. How to check if you’re on the latest Firmware? Click the Tools option on the Navigation menu for the selected Drobo device to open the Tools page. Power off both source and destination Drobo devices. Remove the disks from the source Drobo device and insert them into Drobo 5D3. Turn on the Drobo 5D3 by pressing its power toggle button. The Drobo 5D3 may take a few minutes to boot up. When finished, all the data and volumes will be accessible as it was on the source Drobo device.